March and April 2012 are packed with desert art events crowned by Desertscapes, the third annual Valleywide celebration of desert art. Participants include the City of Palm Desert, the Walter N. Marks Center for the Arts at College of the Desert, the Coachella Valley Watercolor Society, the Desert Art Center, the Palm Springs Art Museum, California Desert Art and others. Opens April 2nd-28th, April 14th reception and Appraisal Day: the Historical Society of Palm Desert presents an exhibit of Jimmy Swinnerton and other early desert painters. Art appraisers Kevin and Diane Stewart generously donated a collection of Swinnerton memorabilia, including his trademark pipes. Meet the Stewarts and local artists who represent the future of desert painting. As an added bonus, the Stewarts will informally appraise your art treasures for $10 an item. (One item free for historical society members). Please call ahead for reservations. The collectors will share their comprehensive collection of California desert art, along with Lou Armentrout’s original paintings. Artists represented include Jimmy Swinnerton, Sam Hyde Harris, F. Grayson Sayre, Carl Eytel, Gordon Coutts, Jean Mannheim and many others. 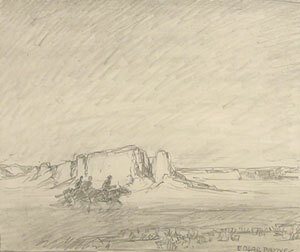 Watch California Desert Art for an article on the collection. April 28th The Mojave Desert Land Trust sponsors a paint-out on an environmentally important parcel: The Joshua Tree Wildlife Linkage. Participants include Morongo basin artists, members of the newly-formed desert chapter of the California Art Club and the Coachella Valley Watercolor Society. The paint out will be followed by an auction of the artists’ work at Joshua Tree Art Gallery. Free, 9 a.m. through noon. Artist’s Auction at Joshua Tree Art Gallery, 5 pm–7:30. www.mojavedesertlandtrust.org or www.joshuatreeartgallery.com, 760-366-5440. March 18th Desert artist Sue Walters and glass and bronze sculptor Patrick Blythe (teacher of a class on Art and Spirituality for Osher Institute) along with contemporary impressionist Hergis show work in the Courtyard and Gardens at the Bromley Building , 73-833 El Paseo, 12 to 5 pm. For information: (760) 834-8429. 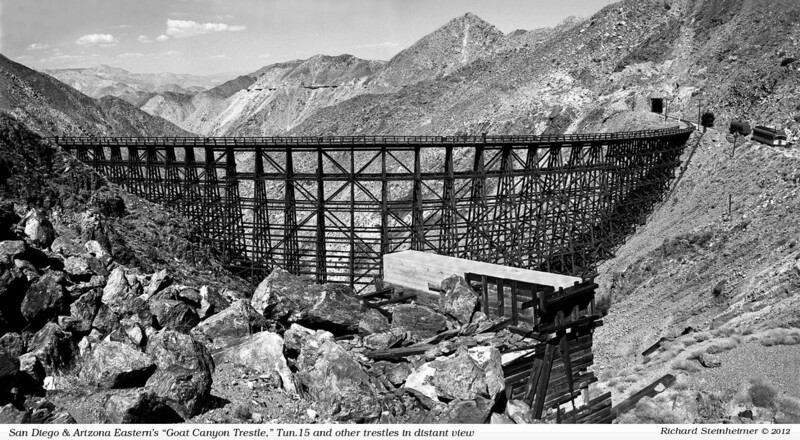 San Diego and Arizona Eastern Railroad, Goat Canyon Trestle, by Richard Steinheimer. For more on Glenda Nordmeyer, see: http://www.californiadesertart.com/?p=913 Ongoing through May 28. If you find yourself in Flagstaff before Memorial Day, be sure to catch the Shadows on the Mesa exhibit at the Museum of Northern Arizona. Curator Gary Fillmore is well-versed in Coachella Valley art, having written books on Marjorie Reed and Jimmy Swinnerton. 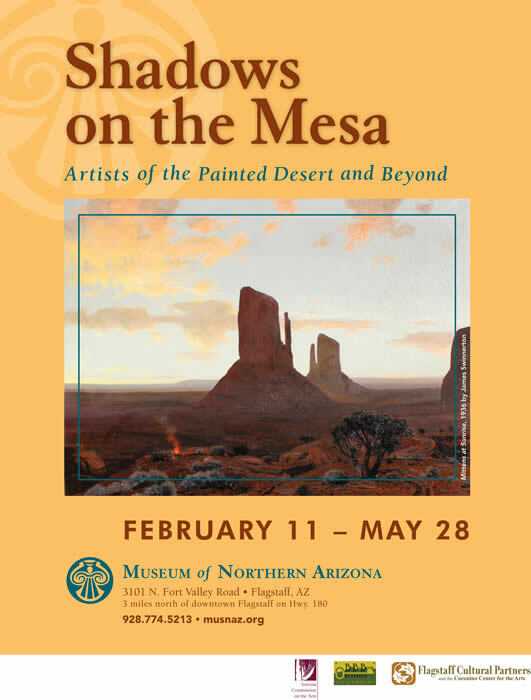 Many of the featured artists in this exhibit—Carl Oscar Borg, Maynard Dixon, James Swinnerton, Gunnar Widforss and others—also painted in the Coachella Valley. Gary Fillmore’s accompanying book is a tribute to the artists who visited the Wetherill trading post in Kayenta, Arizona. Ongoing through the spring. The Desert Institute (the educational arm of the Joshua Tree National Park Association) does its part to nurture new desert artists with its line-up of arts courses. Take advantage of the roomy open-air classroom and check out upcoming classes in watercolor, oil painting night-sky photography, macro (small scale) photography and more. Pick up a Diane Best (one of the finest desert painters working today) T-shirt when you register for a class.